In an instance of programming wizardry, the “exhilarating” (Gramophone) Anderson & Roe Piano Duo has crafted an album showcasing the immense stylistic and expressive variety of Bach’s art. Where else can one find the apex of scholarly composition, The Art of Fugue, featured alongside one of the monuments of sacred music, the St. Matthew Passion? From heartfelt cantatas and virtuosic concertos to feats of contrapuntal aplomb, this versatile compilation sheds new light on Bach's art and ultimately reveals the matchless brilliance of the man, heard through the dynamic interplay of Anderson & Roe. The U.S. branch of the Steinway piano firm has issued a series of piano recordings that is has Read more carefully curated so as to reflect the company's roots in the music scene of a century ago, or a bit more. This gives the label's output a satisfying coherence as well as bringing forth some intriguing individual concepts. This release by the Anderson & Roe piano duo is a representative example that might appeal to those who've had their fill of severe historical-performance approaches to Bach. It wouldn't have been strange in the 19th century to present an evening of Bach's music on two pianos, for that medium was a common one for bringing music of large dimensions into the home or a small community venue. Greg Anderson and Elizabeth Joy Roe thus capture a slice of the American musical past, but they also expand upon it creatively, which is what brings projects like this to life. They employ the talents of a variety of arrangers, including themselves, and they cover such unexpected items as the St. Matthew Passion, BWV 244, in a suite of their own devising. The result is a program that views the range of Bach's creativity under a different lens from those anybody else has used. As the graphics have it, "Where else can one find the apex of scholarly composition, The Art of Fugue, featured alongside one of the monuments of sacred music, the St. Matthew Passion?" Throw some chorales into the mix, and there will be an idea of the considerable appeal of this release, recorded at the ideally sized Concert Hall of the Performing Arts Center, Purchase College, the State University of New York. 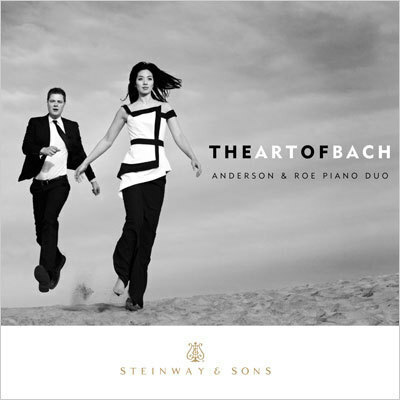 For their third Steinway & Sons release, the Anderson & Roe Piano Duo dedicate their uncanny ensemble prowess and canny programme-building to JS Bach. The eloquent reserve of Kurtág's so-called E flat Sonatina leads into the C major Concerto for two keyboards (sans orchestra), which stands out for the duo's gorgeously calibrated legato slow movement, plus relaxed propulsion and playful conversational ease in the fugal finale. While the idea of five St Matthew Passion numbers arranged into a two-piano suite is tantamount to box-office poison, it actually works. What is more, the duo's restraint and taste reveal how the music's expressive poignancy stands up without sung texts. Perhaps more varied phrasings would have brought out more of the Art of Fugue Contrapunctus IX's vivacity but the pianists' double-dotting in Bach's two keyboard arrangement of the three-voice mirror fugue allows the music to dance off the page. Subtle dissonant inflections and feathery staccato articulation distinguish a selection of Canons based on the Goldberg Variations' ground. A specially arranged aria from Cantata No 127 (with the excellent violin soloist Augustin Hadelich as special guest) gently wanders into Romantic pianism's registral extremes. The duo link the outer movements of the Bach/Reger Third Brandenburg Concerto (what a tempo for the final Allegro!) with a cadenza that liberally quotes from the Chromatic Fantasy's arpeggiated chord sequence. And why not? After all, Bach borrowed - indeed, stole - from himself all the time. Certainly he would have embraced Anderson & Roe's ingenuity and musicianship. "This contemplative, refreshing album from Greg Anderson and Elizabeth Joy Roe, partners since 2002, has—unusually—several transcriptions of sacred pieces. “God’s Time is the Best Time” makes for a tender prelude to the bright and cheerful Concerto in C for two keyboards. Some of the phrasing in its first movement is, I think, meant to sound impetuous, but it often comes across a little abrupt, especially in contrast to the mellifluous slow movement. In the nimble finale, one of the duo’s best characteristics is on display, the ability to bring clarity of line to textures that could easily sound cluttered. The homophonic writing in pieces like St. Matthew’s Passion can be even denser, and the pianists outdo themselves in illuminating the music’s salient points. These five movements are sublime... Max Reger’s transcription of the Third Brandenburg Concerto is a glittering, fantastic ending to this gorgeous-sounding release." Period: Baroque Written: by 1708 Mühlhausen, Germany Date of Recording: 1/23-1/25 2014 Length: 2 Minutes 30 Secs. Period: Baroque Written: 1738-1739 Leipzig, Germany Date of Recording: 1/23-1/25 2014 Length: 18 Minutes 03 Secs. Period: Baroque Written: ?1727 Leipzig, Germany Date of Recording: 1/23-1/25 2014 Length: 6 Minutes 9 Secs. Period: Baroque Written: ?1727 Leipzig, Germany Date of Recording: 1/23-1/25 2014 Length: 1 Minutes 1 Secs. Period: Baroque Written: 1727 Date of Recording: 1/23-1/25 2014 Length: 4 Minutes 57 Secs. Period: Baroque Written: ?1727 Leipzig, Germany Date of Recording: 1/23-1/25 2014 Length: 1 Minutes 3 Secs. Period: Baroque Written: ?1727 Leipzig, Germany Date of Recording: 1/23-1/25 2014 Length: 5 Minutes 40 Secs. Period: Baroque Written: circa 1745-1750 Leipzig, Germany Date of Recording: 1/23-1/25 2014 Length: 2 Minutes 23 Secs. Period: Baroque Written: circa 1745-1750 Leipzig, Germany Length: 2 Minutes 17 Secs. Period: Baroque Written: circa 1745-1750 Leipzig, Germany Length: 2 Minutes 22 Secs. Period: Baroque Written: ?1731 Leipzig, Germany Date of Recording: 1/23-1/25 2014 Length: 3 Minutes 7 Secs. Period: Baroque Written: 1725 Leipzig, Germany Date of Recording: 1/23-1/25 2014 Length: 8 Minutes 58 Secs. 13. Was mir behagt, ist nur die muntre Jagd!, BWV 208: Schafe können sicher weiden "Sheep May Safely Graze"
Period: Baroque Written: 1713 Cöthen, Germany Date of Recording: 1/23-1/25 2014 Length: 4 Minutes 48 Secs. Period: Baroque Written: 1711-1713 ?Weimar, Germany Date of Recording: 1/23-1/25 2014 Length: 10 Minutes 55 Secs.